It’s never too early to get a jump start on the coolest gifts for kids. There’s nothing worse than being under the gun, while people continually post the countdown on social media (the stress is real!). 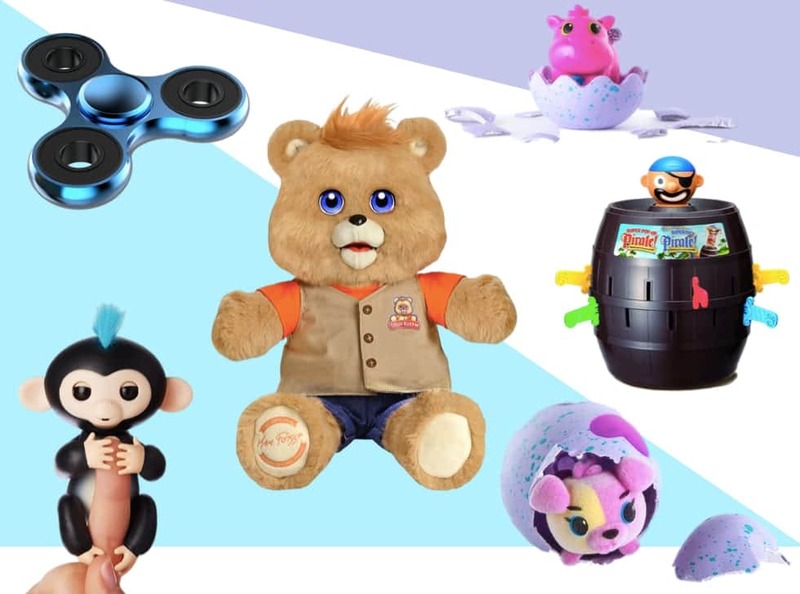 We’ve scoured some of the top toy wish-lists and all-around great gift ideas . As a result, we’ve uncovered the best selling toys and games from the top toy retailers – and found the best prices so you don’t have to. Shop some of the best toys below! Available for pre-order, these mystery Hatchimals will be released on October 5th. Get ready to love and care for these little eggs, and find out who pops out! The follow up to the original Don’t Step In It Game, features everyone’s favorite – Unicorns! Blindfolded, players make their way around the game board, trying not to step in unicorn poop. Just like on the walk to school! A puppy that you won’t have to train! This pup wags his tail, sleeps, kisses and more. You know you or your siblings grew up with Teddy, but this is the Teddy Ruxpin of the Digital Age. As in, touch sensors, apps, and LCD eyes with over 40 animations. Eye mask included in pocket of Teddy’s vest. We’re not asking questions. He rolls along and is able to interact with other Star Wars App-enabled Droids by Sphero. Kids can unwrap layers of surprises. Includes a limited-edition Doll and Lil Sister, 6 surprise pearl balls, while the case doubles as a bath playset. Comes with twice as many gears as the original Spirograph, including a gold-colored metal 50th anniversary commemorative Spirograph gear, Spiro-putty, 3 pens, and 2 pads of paper. Totally 80’s! Simply put on some vision-altering goggles, start drawing, and have your team try to guess what exactly it is that you’re drawing. We used to play this in college without goggles, but this is the kid-friendly version and really fun for the whole fam. Since you’ve got L.O.L. Surprise Dolls taking up residence all over your house, it’s time they’ve found their own place. This multi-story house (three feet x three feet) features a working elevator, lights and sounds, a pool, spa and sandbox. On second thought, you might want to let them keep your house, and you move in. Transforms from ship to land vehicle – all while using flashing lights and sounds. Because rolling noisily down the street, and being heard for miles is pretty much a rite of passage. Also available in blue. Includes giant reversible plush, 1 or 2 exclusive reversible scented medium Pikmi Flips hidden inside, and surprise items! Dog and bunny also available. Play as your favorite Harry Potter character like Harry himself, Hermione, Ron, or Neville. Defend the wizarding (wizardly?) world from all evil forces. Have a blast gaining influence, mastering the most powerful spells, discover magical items, recruit allies, and more! This funny little minion says 25 minion sayings and has free moving eyes and arms! Plus, simply press his pocket or even move his head for the best reactions ever! The PG version of Cards Against Humanity. More surprises! Under Wraps includes 15 surprises. (a spy glass, secret message sticker , surprise codes, a bottle, mystery disguise, shoes, a fashion accessory, an outfit, and an L.O.L Surprise eye spy under wraps doll. LuvaBella, is the cutest (and creepiest?) interactive baby doll that laughs, learns words, eats, drinks, sleeps, plays, and gives super-real facial and eye expressions. Read the full LuvaBella doll review here. The New Wonder Woman LEGO Set – Check The Price Here This Lego set features a Wonder Woman figure, a bed with space for a trophy (obviously), Wonder Woman’s ‘invisible’ motorbike (insert joke here), her Golden Lasso, a wrench, two spray paint cans, trophy and a tub of wax polish for the bike. This pocket sized (Awww) robot allows kids to code screen free using a marker, or online with the OzoBlockly programming editor, dragging and dropping to create Bit code. A 3-pack of non-toxic, BPA/Phthalate/Latex-Free, satisfying squishiness! Interactive Chewie features over 100 sound and motion combinations, responds in the Wookiee language, and reacts whenever he’s in motion. Far out. Thinking Putty comes in different colors, illusions, glow-in-the-dark, heat-sensitive, (remember Hyper-Color shirts?!) and more. Stretch it, roll it, and bounce it. The satisfying addictiveness and stress relief is a total win. This 878 piece set includes house banners, tower with movable spiral staircase, a potions room, treasure room, 10 minifigures: (Harry Potter, Ron Weasley, Hermione Granger, Draco Malfoy, Susan Bones, Professor McGonagall, Professor Quirrell with dual Lord Voldemort face, Hagrid, Albus Dumbledore and Nearly Headless Nick) and more. Whoa! You had us at use the crowbar to pop the lock and open your creatures crate. Pull his tongue and he vibrates, makes noises and has glowing eyes. …because you know you and your kids are still watching The Trolls movie over and over again. And again. And over again. This always lovable “Hug Time’ Poppy is always up for a hug and speaks 25 phrases every time you give her a little hug and press her tummy. Plus, she plays songs from the movie and even rocks back and forth. Endless joy. A great option for the beginner. Because crashes into trees, houses and possibly oncoming traffic happen. HD captures footage with your iPhone or Android phone devices. Range: about 100 meters; Long Playing Time: 10 mins. For the kiddo with their eyes on the future! Children can record their special talents, achievements, preferences and passions throughout the years, and have a journal full of their favorite things and interests. Interactive Pomsies will tell you when they feel tired, cold or hungry with light up eyes, purring and Pomsie sounds, but don’t worry they don’t always complain, they can also play freeze dance! The coolest 12-inch action figure this year. If your kid loves Star Wars (I mean) they’ll love the 70+ sound and light effects. Plus, the motion sensors and action phrases really bring this Stormtrooper to life. A mystery subscription box filled with fun and educational goodies for girls & boys ages 5-11+. One of the best-selling interactive toys right now on Amazon.com, this super cute FurReal friend responds to touch and interaction with 50 sounds and motion combinations. Plus, you can feed him, fill his tank with water and watch him breath colored mist and burp! You can retire those super boring Lego people that are scattered all over your house and replace them with any of these unique guys and gals. Sure your kids will love ’em, but you will too. For the kid who likes to create and sculpt. This clay air dries after a few days (no baking required!) and their creation can be painted and decorated any way they like. It softens when wet, so they can sculpt easily, and can be painted with tempera, acrylic or watercolors when dry. A 300 piece puzzles measure measuring 24”x30”, featuring one of the things kids love most – candy! Lure them away from their electronic devices with virtual candy. The insanely cool and super cute toy robot that’s as close to a real-life friend you can get. Cozmo learns more about you the more you hang out with it, like facial recognition, your name, and has hundreds of emotions. Fingerling monkeys are back, and bigger than ever. They’ve had it with hanging on fingers, and are ready to wrap kids in a big monkey hug. Also, they burp, toot, laugh, and more. For the kid who loves to be the teacher. Add this cute little Teacher Record Book to the set. Celebrate the release of the newest book! For the die-hard Harry Potter fan. Because…your very own Lightsaber with light and sound!! Tickle Me Elmo is back! He must have a time machine…who knew? They’re unloved and abandoned. Give them a little love and groom them into sweet, loving little pets. Perfect for the kid who is too small for the Razor. The wheels on this provide a super smooth ride and will last long enough for you to pass along to the next kid. And LED wheels? Yes! These are the hottest eco-friendly green toys that are made in America and from 100% recycled materials. Plus, kids have a blast playing with them and adults love that retro vibe to them. They’ll also love the green: Helicopter, Tea Set, Fire Truck, and Airplane! Cute, gender-neutral play kitchen with realistic features & sounds. Volume limiting for kids, lightweight & comfy. Long battery life means hours of music before recharging. Because these are just so stinkin’ cute, and come in everything from super heroes & princesses to Rainbow Bright & Star Wars. And get the latest Wonder Woman itty bitty here! Go beyond your basic Play-Doh sculpting and bring those works of art to virtual life! So fun! See who the best problem solver in the family is. There’s always that one person who’s virtually unbeatable. Pressing BeatBo’s colorful LED grid tummy or the buttons on his feet rewards baby with fun songs, learning content, and dance moves. No more using rocks and used water bottles for bases! Includes first, second, third & home plate. Rut-Roh! Fred looks horrified. Awesome! A great option for kids. (Also works with the iPod Touch). Tracks steps, calories, distance, time, & sleep pattern. I dare you not to say “Luke….I am your father.” after it’s built. Perfect for boys and girls. This 62 piece magnetic set will keep the kids playing, learning, and quiet! Because you should totally pair up your kids love of all things Furby with your obsession with Star Wars. Slated to be the #1 best selling Furby of all time! Play the family-friendly card game that was the most backed project in Kickstarter history. The perfect DIY gift for kids to draw, illustrate and create their very own comic book. Once completed, send it in and you’ll get it back looking professional! A great option for small spaces. For the avid reader and die-hard Harry Potter fan. Comes with everything kids need to build their very own Droid. Includes kid-friendly step-by-step, in-app instructions, limiting the amount help needed from the grown-ups! Because, yes, even your kids want to ask Alexa a ton of question. Eh, better her than you! Not really a toy, but they’ll be able to listen to music, play games, and ask those million questions they have every day! Kids can have their very own Porg. He speaks and makes sounds, all while being cute and cuddly. Because who does’t want a unicorn? Also available in a giant giraffe and dragon, of course. It’s looking at me. Easy lyric reading and synchronizing disco light. Wirelessly stream digital audio from any Bluetooth compatible device. Two microphone jacks to sing duets. And even better? Record and share your (MP3) voice performance. Because isn’t the whole point of “playing cars” crashing them? Quick, get them cleaning before they realize how terrible it is!